Ten years ago, German filmmaker Nicolaus Mesterharm rented a multistory house near Wat Botum pagoda as a home and office for his newly created production company. It felt like there was too much space, so he decided to do something with it. Having worked with Cambodian colleagues for years, he said, “I knew about their constraints…that my camera people, my film people hadn’t actually seen good documentaries.” And they were eager to see what was done in other parts of the world. 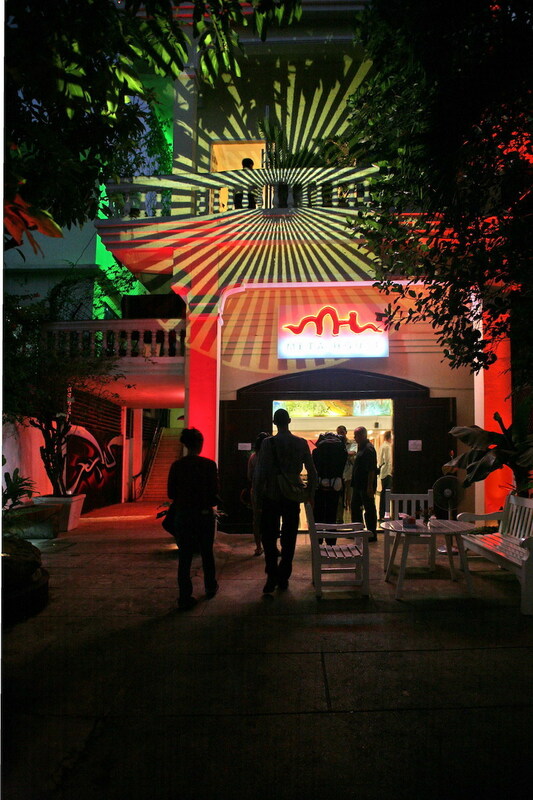 Over the years, Meta House would become a hub for artists in Phnom Penh. “It blossomed like a lotus flower,” Mr. Mesterharm said. Now, with a staff of 36, it offers a weekly program of films and events ranging from arts exhibitions and book launches to Western classical music concerts and DJs playing electronic music late into the night. That included moving location in 2010. Having become a Goethe Center in partnership with Germany’s cultural institution Goethe-Institut, Meta House needed a location more accessible to the public and to students taking German classes on its premises, Mr. Mesterharm said. Meta House’s program has always been diverse. Its first exhibition at its current location in 2010 was about counterfeit drugs, and several Cambodian artists exhibited works to illustrate the problem. Last May, Meta House held a Gay Pride Film Festival featuring 20 Cambodian and foreign films. Film screenings are typically free. Last year, Mr. Mesterharm was taken aback when the Culture Ministry told him he could not show a documentary, “I Am Chut Wutty,” about the environmental activist killed by government security forces in 2012. But he said he is heartened that artists are now engaging with the ministry to discuss policies and activities, creating a dialogue around the country’s modern culture. For its 10th anniversary, Meta House is throwing a birthday party on Saturday featuring an exhibit of German painters, a crew of DJs, and rare clips and slideshows from its archive.